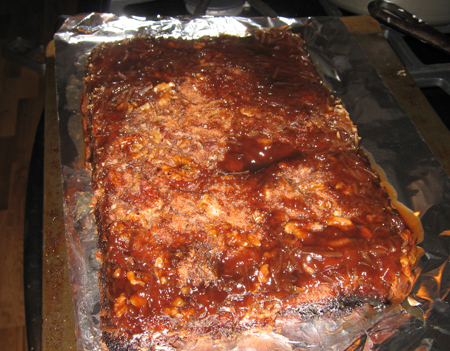 The baking has going fairly well, despite my disappointment with the first recipe of the day, German Chocolate Upside Down Cake from allrecipes. This is why I hate being the first one to try random recipes which haven’t been reviewed. In all fairness to the cake, it looks okay when cut. But sheesh, this must be the ugliest cake I’ve ever made. It’s also a bit too sweet. The crumb is good but the topping borders on cloying and I will not be making it again. I’d throw it away, but I’ve learned that people sometimes like the things I do not so I’ll get some opinions this evening. The second dessert is a vegan apple pie. It’s actually called “apple crumb pie” and the recipe is from Allrecipes. I called it vegan apple pie, because I used Mrs. Smith’s pie crust which contains no butter and used Earth Balance spread in the topping. This pie is going to be excellent. Then again, anything will look good next to that atrocity of a cake. Alison, you were right about the cake. BTW, those pasta shells on The Flour Room sound fabulous. I haven’t made pasta shells in ages. Lauren, do you have a specific recipe for apple crumb pie? I’d be interested in seeing yours. Janet, I was lucky because I had shopped ahead of time, then trapped inside because of rain. The rain kept me in line. I’d get a lot more done if I lived in some place like Seattle. Anna! You are unbelieveable…you did ALL that baking today and prepared for a Halloween party tonight!! I think we might ought to call you the Eveready Battery Bunny, you seem to just have endless energy and just keep going and going. Thanks for sharing! That apple pie looks very tasty. 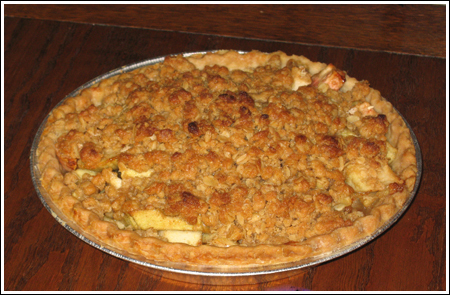 One of my favorite desserts ever – apple crumb pie. 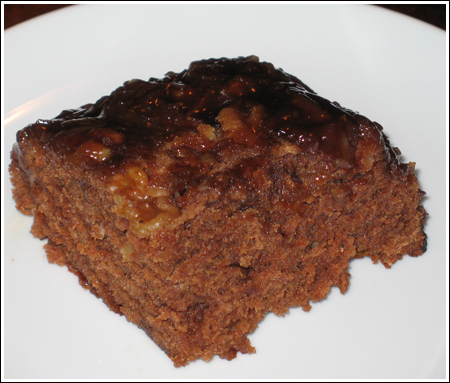 good luck with the german chocolate cake – i’m sure your guests will find it tasty. It’s raining cats and dogs right now. I’ve never picked Fuzz up from Kindergarten in rainy weather, so this should be interesting. Steph, I’ll put the cake out of sight so I won’t be tempted to toss it. Claire, I might try throwing in few oats. I only made half a batch. T, I don’t know what I’m going to wear — probably just a dress. Fuzz is going to dress up as a Cowgirl. 3. i wonder if you’ll be wearing a costume? Wow, the apple pie looks so good…I want a piece right now! 🙂 The pumpkin cookies have promise…maybe add some oatmeal to it to give some texture but keep the taste of the pumpkin? I agree though that the white chips would probably the the best part! That cake is ugly, but all german chocolate cakes are ugly and too sweet (IMO). Definitely keep it – my family would love it so hopefully your guests will have sweet teeth too.